Investors are hoping that 20 percent-plus earnings growth in the third quarter will put the bull market back on track, but some may be surprised by companies' rising concerns about higher costs. 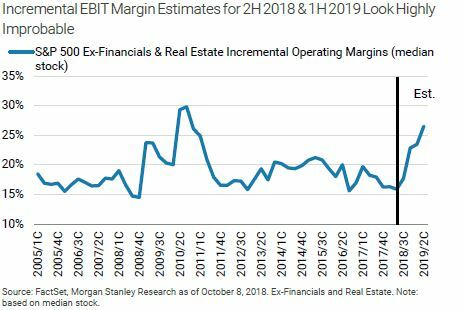 Morgan Stanley's Mike Wilson says in a note titled "No margin for error" that companies are too optimistic that they can pass on higher costs and Wall Street is too positive about profit margins. The industries most at risk for disappointment are tech, consumer discretionary and transportation, according to analysts. Caution tape outside the New York Stock Exchange in New York on Jan. 23, 2018. Investors are looking toward the third quarter's expected 20 percent-plus earnings growth as fuel to put the bull market back on track, but several analysts warn that the earnings season may bring a new cause for concern. Morgan Stanley chief equity analyst Mike Wilson is among the latest to warn that rising costs may bite into profits more than expected and expectations are too optimistic. Goldman Sachs chief equity strategist David Kostin warned about rising rates and higher costs earlier in the week, and RBC chief equity analyst Lori Calvasina said she has been cautious on the earnings season because of the negative potential from rising costs from tariffs to show up in earnings outlooks. "Optimistic estimates reflect constructive company guidance around margins, despite rising costs," wrote Wilson, who is chief U.S. equity strategist and chief investment officer of Morgan Stanley Institutional Securities and Morgan Stanley Wealth Management. Rising interest rates and concerns about trade wars have triggered a sell-off in stocks. The Dow was down 230 points in early afternoon trading, after an 832 point drop Wednesday. The index is now down 4.2 percent for the month, while the broader S&P 500 is down 5.5 percent. Tech has led the declines, and the tech-heavy Nasdaq is down 8.3 percent since the start of October. Wilson said technology stocks are vulnerable to rising costs. "Many investors we speak to believe elevated Tech margins will remain resilient, keeping margins stable for the overall market. We disagree and argue that Tech is more cyclical than many appreciate," he wrote. Morgan Stanley analysts analyzed 400 companies' comments on costs in second quarter earnings transcripts. "Compensation, commodity, and transportation costs were mentioned most frequently. ... Tariffs came up less often and were consistently discussed in a 'wait and see' framework. 45% of S&P 500 companies mentioned at least one cost headwind, and data shows that this trend has been on the rise." In a note titled, 'No margin for error,' Wilson said companies are optimistic that they can pass on higher costs. "According to consensus, 2019 will be the third consecutive year of margin expansion at the benchmark level," Wilson said. "We find that hard to believe. Margin estimates for the following calendar year are typically revised lower over time, but the decline in 2019 estimates has been relatively modest thus far in 2018 (-0.7% from January through September vs. the 7-year average of -1.7%)." Based on Morgan Stanley's study, companies in the transportation sector, tech and consumer discretionary were found to have high profit-margin risk but also have had optimistic expectations and valuations. On the other hand, companies in the food sector, beverage and tobacco and some health companies have low margin risk and relatively pessimistic expectations — a much more positive combination for investors. "When inflation expectations are rising, things like energy, financials, materials outperform and growth areas of the market, like tech, consumer discretionary and the new communications services underperform," Calvasina said. Topping Morgan Stanley's list of margin concerns are rising wages, with average hourly earnings growth expected to rise to 3.3 percent next year from 2.8 percent currently. Other factors include expected gains in energy and other commodities prices; freight cost inflation, and higher interest rates. The costs from the rising U.S.- China trade conflict have not been priced in and the impact is still unclear. "We've been worried about the reporting season. We didn't expect this technical unwind" in stocks, she said. "But we felt we were where the market need to be, at its recent highs. ... We were really just telling people not to chase. We were telling people there would be a better entry point." Morgan Stanley expects earnings growth of just 5 percent next year, just half of Wall Street's consensus of 10 percent. This year, analysts expect earnings to grow by 23 percent, according to Thomson Reuters.